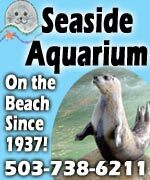 (Oregon Coast) – CoastWatch, an environmental watch group that keeps an eye on Oregon coast beaches, is also promoting the natural sciences of the coastal region these days with a series of special events all over the coast. CoastWatch members “adopt” a mile of beach, then check it quarterly for environmental problems with the plants, fish, animal life or the water. But all through March and April, CoastWatch and Oregon Shores members are either sponsoring, putting on or promoting numerous events which take on a variety of science subjects, all of which will prove engaging and informative. This includes the Coast Conference Central this week, which is a CoastWatch event aimed at informing its members as well as the public. Other events include a survey checking for dead sea birds, a slide presentation on rocky shorelines, a movie about Oregon coast science, cleaning up a watershed area near Nehalem, a program about the Oregon beach bill, a talk on global warming that comes with a personal touch from Al Gore, various bird programs and much more. It all begins later this week. The central coast gets a turn at an intensive set of talks and workshops when Coast Conference Central comes to Florence this Friday and Saturday, March 2-3. Background talks on coastal science and how-to workshops will both be featured at the event, which takes place at Lane Community College’s Florence branch. At 4 p.m. on Friday, Oregon Shores’ land use director, Cameron La Follette, will lead a very basic, how-to-do-it workshop on citizen involvement in Oregon’s land use planning process. This is event is especially for those who want to know how to speak up and make a difference on land use issues. The main event is Saturday, March 3, beginning at 10 a.m. (registration begins at 9:30). Speakers include Nancy Steinberg on rocky shore ecology; former Sea Grant educator Vicki Osis on the current state of our knowledge about climate change (including impacts on coastal areas and the possible causes of the “dead zone”); and geologist Roger Hart on Oregon’s changing sandy shoreline. Workshops in the afternoon will include one led by marine ecologist Cynthia Trowbridge on invasive species of the shoreline, and one involving both Cameron La Follette and Paul Robertson, manager of the Devils Lake Water Improvement District, on the link between land use planning and protecting clean water. The conference is free and open to the public. Lane Community College at Florence is located at 3149 Oak St. (next to Siuslaw High School, one block west of Hwy. 101). For more information, contact Phillip Johnson, CoastWatch Director at (503) 238-4450. A full roster of events is at the bottom of this article. CoastWatch members often go beyond watching their own miles once per quarter, to participate in once-a-month beached bird surveys. CoastWatch is a partner with COASST (Coastal Observation and Seabird Survey Team), based at the University of Washington, in tracking “beachcast” birds on the Oregon coast. Mile adopters work in teams - not necessarily on their own miles - to engage in this form of citizen science. The public is invited to participate. It is for those who might have an interest in participating in the survey anywhere on the coast and would like to experience the tasks for themselves, or those curious about beached birds and citizen science. Join the team that surveys the Baker Beach site north of Florence on Friday, March 2, beginning at 8 a.m. Directions to the survey site: Turn west off Highway 101 onto Baker Beach Road about six miles north of Florence. Drive to the end, where there is a U.S. Forest Service campground and parking lot for beach access. Parking requires a federal pass or payment of the day use fee at the self-pay station. Plan to be at the parking lot at 8 a.m., rain or shine. 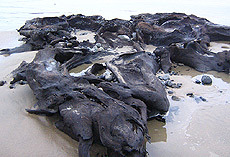 This trip generally takes three to four hours depending upon how many dead birds are washed up on the beach. If it is raining or windy, dress in warm, rainproof clothing and bring a hat and gloves. Surveyors will walk out to Baker Beach on a trail that requires about a half-mile hike on loose sand and then up over some large sand dunes. Those who join the survey team are invited to join them for a no-host lunch at the Thai Talay in Florence afterwards. For more information, call Anne Caples at (541) 902-9314. Environmental educator Nancy Steinberg will present a specially commissioned slide talk, “Connections: A Tale of Rocky Shores and the Ocean Next Door,” on three occasions. One is at Coast Conference Central. The second will be in Eugene on Thursday, March 15, 7 p.m. at the REI store, 306 Lawrence. The Eugene REI store has adopted a CoastWatch mile, and is co-sponsoring this event. Finally, Nancy will give the talk Thursday, April 5, 7 p.m. at the Cannon Beach Community Hall (sometimes called the Chamber Hall, adjacent to the Chamber of Commerce at 207 N. Spruce St.). 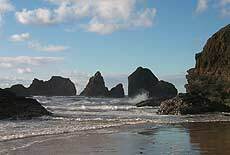 This event is co-sponsored by Friends of Haystack Rock. 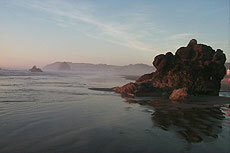 “Connections” focus on the links between Oregon’s rocky shorelines and the nearshore ocean. 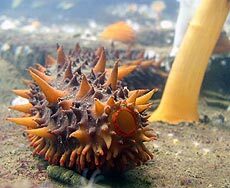 It provides the science background that underpins Oregon Shores’ drive to protect intertidal areas and ocean habitats as part of one, broad grassroots movement, through the Oregon Coastal Ocean and Intertidal Conservation Project. The profusely illustrated talk explores some of the most recent research, much of it conducted in Oregon, on the ecological links between shoreline and sea. Tuesday, Feb. 27: Lawrence Bitte, one of the pioneers in the effort to create Oregon’s Beach Bill in the ‘60s, will speak on “Oregon Beaches: Our Birthright” in Portland, 7 p.m., Linus Pauling House, 3941 S.E. Hawthorne Blvd. Tuesday, March 6: Showing of Green Fire Productions’ “Common Ground: Oregon’s Ocean,” 6:30-8 p.m. in Smith Auditorium at Willamette University in Salem. After the film, a panel featuring Dr. Jane Lubchenco of Oregon State University, commercial fisherman Jeff Feldner, Carolyn Waldron, director of the Oregon Ocean coalition (of which Oregon Shores is a founding member), and others, will hold a Q&A discussion. Wednesday, March 7: Shorebird researchers Elise Elliott-Smith of the U.S. Geological Survey and Liz Kelly of U.S. Fish & Wildlife Service will present “Black Oystercatchers on the Oregon Coast” at 7 p.m. at the Port Orford City Hall (555 W. 20th St.). This event is presented by Kalmiopsis Audubon Society and co-sponsored by the Curry Sierra Club group. Friday, March 9: Free presentation, “Global Warming: What Could It Mean to the Oregon Coast?” sponsored by Tillamook Estuaries Partnership and Tillamook Headlight-Herald, 7 p.m., Tillamook County Fairgrounds, 4603 E. Third St. in Tillamook. Event features Al Gore’s slide show, “An Inconvenient Truth,” as presented by Oregon Secretary of State Bill Bradbury (who was personally trained by Gore to narrate the show). Also featured are Jonathan Allan of the Oregon Department of Geology and Mineral Industries, and Michael Harte, who directs the Marine Resources Management Program at Oregon State University. Saturday, March 17: Coastal Futures Project/Envision Oregon Town Hall Meeting, 8:30 a.m.-3 p.m. at The Barn in City Park, 11th St. SW. in Bandon. Oregon Shores co-sponsors this 1000 Friends of Oregon event, an opportunity to ponder our state’s future and the plans that could get us there. A panel discussion features Bob Stacey, executive director of 1000 Friends; Oregon Secretary of State Bill Bradbury; Jefferson Smith of the youth-oriented Bus Project; and Onno Husing, director of the Oregon Coastal Zone Management Association. A continental breakfast will be served at 8:30; lunch will be provided. To register, call 1000 Friends at (503) 497-1000. Thursday, April 5: Nancy Steinberg presents “Connections” in Cannon Beach at 7 p.m. in an event co-sponsored by Friends of Haystack Rock at the Cannon Beach Community Hall, 207 N. Spruce St. CoastWatchers are also invited to join the Friends for a potluck at 6 p.m. at the same location. Saturday, April 28: Workshop on invasive species led by marine ecologist Cynthia Trowbridge, 1 p.m. to approximately 5 p.m. Begins at Boat House Auditorium of Oregon Institute of Marine Biology in Charleston; a field trip to the Charleston dock will begin at about 3:30 p.m. Event sponsored by Coos County CoastWatch support group.